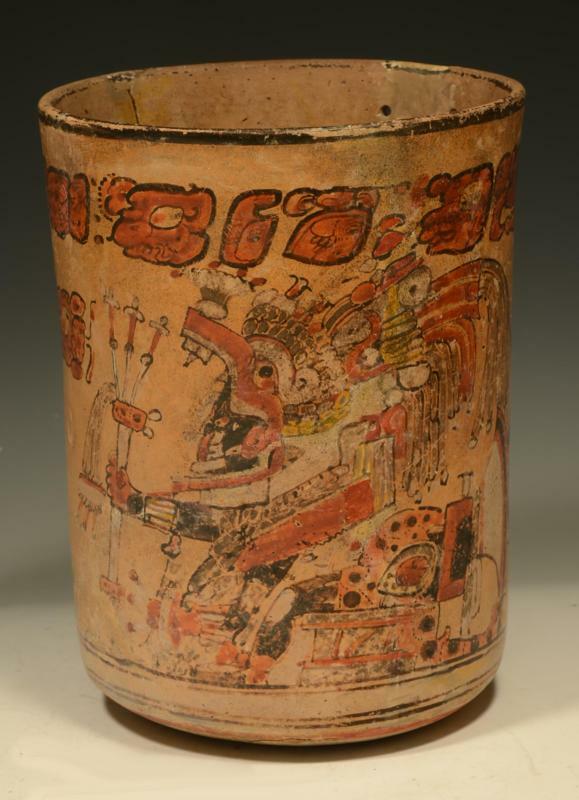 This compelling mythological Mayan painted cylinder depicts a ruler enthroned in the jaws of the serpent of the otherworld. The top register contains the Primary Standard Sequence, a sequence of characters identified by scholar Michael Coe in The Maya Scribe and his World in 1973. These characters are glyphs that are repeated in a similar formation on many vessels and are thought to be associated with Mayan mythic and religious rituals. The ruler, or cacique, was an important figure in Mayan culture as was the mythology of the underworld. The Mayans believed that human souls were required as a sacrifice to continue to propel the wheel of cosmic order, and that the soul would live beyond the death of the body in another dimension. Various fierce anthropomorphized serpent figures, such as the one depicted here, were employed by the Mayans to represent the archetypal forces of death and sacrifice. This is certainly in keeping with the bold, terrible, and formidable monstrous nature of the cacique, the serpent god, and the general aesthetic of the vase, which is painted in broad, sweeping lines of motion, using vibrant and large red blocks and aggressive black lines that weave in and out and morph from curving to linear at a moments notice. Size 7-7/8 inches (20cm) H. Repaired from about 3 or 4 pieces and base has fill. Old repair exhibits 4 small circular ancient drill holes. Excellent original painted surface. Archived on Mayavase.com k9317. Ex Hiroshi Muria, Old Japanese collection.